Conway is a small town on Historic U.S. 66 famous for its "Bug Farm" (VW beetles buried nose down in the ground) and for the Preserved segment of U.S. 66, listed in the National Register of Historic Places. Elevation: 3,460 ft. (1,055 m). Population: est. 20 (2000 census). Conway is located in the south of Carson County, in the central region of the Texas Panhandle. The Panhandle region was peopled by hunter-gatherers over 10,000 years ago. Their Clovis stone tools have been found in nearby New Mexico, and belong to some of the first humans to reach America. Until the Spanish introduced Old World horses to America, the local Comanche and Kiowa Indians hunted buffalo and deer on foot. Later they learned to ride and were masters of the plains until well after the independence of Texas and its annexation by the U.S. Between 1874 and 1875 a war raged between the natives and the U.S. Army which led to the defeat of the Indians and their confinement in reservations. The grasslands were opened to the pioneers. The first building to go up in what would become Conway was a Lone Star School, built in 1892 for the children of homesteaders and ranchers. It was followed by a post office (1903) and the Chicago, Rock Island and Gulf Railway (also 1903). In 1905, J. D. Delzell and P. H. Fisher founded the town which they named Conway, after H. B. Conway, who had been a Carson County commissioner. A church was built in 1912 and the community slowly grew, its economy rooted in cattle and farming. When U.S. highway 66 was established in 1926, its alignment passed through Conway and the town's population grew from 25 in 1925 to 125 in 1939 (despite the Depression and the Dust Bowl years). Population grew until the late 1960s, and then began to fall. The post office closed in 1976 and the railway terminated its operations in 1980. I-40 bypassed the town and business moved out. Current population is estimated at around 20. 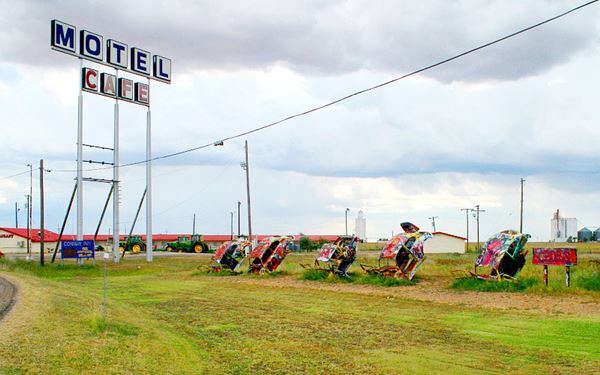 The closest motel is in Claude, just 6 miles south of Conway along TX-207: LA Motel, Claude, TX. Try hotels in the nearest big towns: Shamrock, 52 miles (84 km) east of Groom or Amarillo, 45 mi (72 km) west. What is the Weather in Conway? 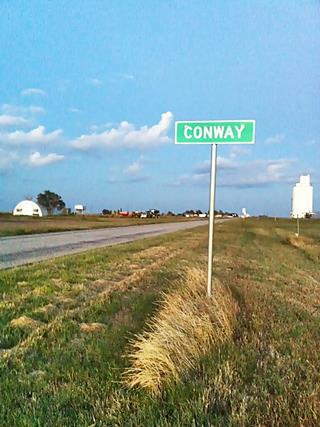 Where is Conway on U.S. Hwy. 66? With an average rainfall of 23 in. (600 mm); the Panhandle is a dry region. Summer is hot, with average highs over 90°F (30°C) and average lows of 65°F (19°C). During winter high temperatures average 50°F (10°C) with below-freezing lows below: 25°F (-4°C). Snow does fall in Conway and this can happen at any time between September and May (although the first flakes fall on the first week of December). The high altitude causes greater snowfall than locations further to the east: 18” per year on average (with peaks of over 40”) between 43 and 102 cm. Conway is the first town to the west of Groom (16.5 mi away) along I-40. Take Exit 96 and go south along TX 207 for 1 mile to reach Conway. It is 69 mi (111 km) west of the Texas - Oklahoma state line. Heading west from Conway, it is 29 miles (47 km) to Amarillo and 96 miles (154 km) to the New Mexico state line. To the east it is 68 mi (109 km) to Shamrock. 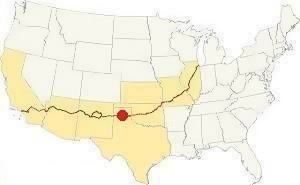 Check out Conway on our Route 66 Map of Texas, with the complete alignment and all the towns along it. Blue: Original alignment of US 66 between Amarillo and Conway. In Black are road sections that are now buried under the freeway or the airport. Below you will find full details on Old Route 66 in Conway. Tiny town famous for its "Bug Farm" and the Historical segment of U.S. 66, listed in the National Register of Historic Places. The town of Conway consists of a few homes scattered along U.S. Highway 66 at the point where westbound TX 207 (Route 66) meets northbound County Road N. At the intersection, TX 207 turns north and crosses I-40 at Exit 96. FM 2161 keeps a westward alignment, as U.S. Highway 66. The corridor where the railway once ran is on the south side of the highway. The tracks have been removed. Since 1967 the Crutchfields have operated a service station and souvenir shop on the south frontage road of I-40 at its crossing with TX 207 in Conway. But business took a turn for the worse when a Love's Travel Stop (a truck stop) opened on the other side of I-40: most of the potential customers went there. 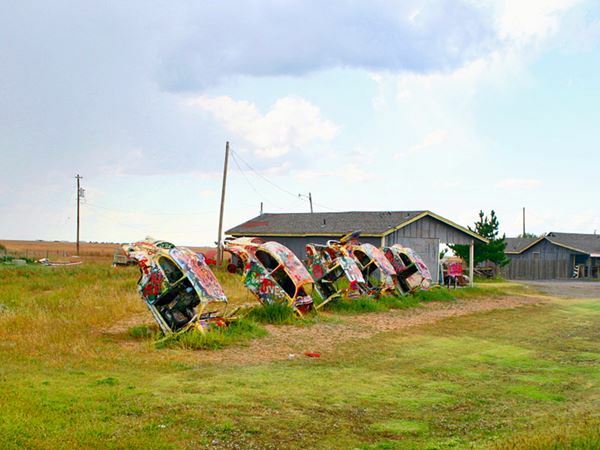 So the Crutchfields decided to create an attraction on the south side of the Interstate and found inspiration in the Cadillac Ranch (west of Amarillo): they parodied it by burying five Volkswagen Beetles (Bugs) nose down in the ground. Visitors came but business did not improve and the Crutchfields moved on. 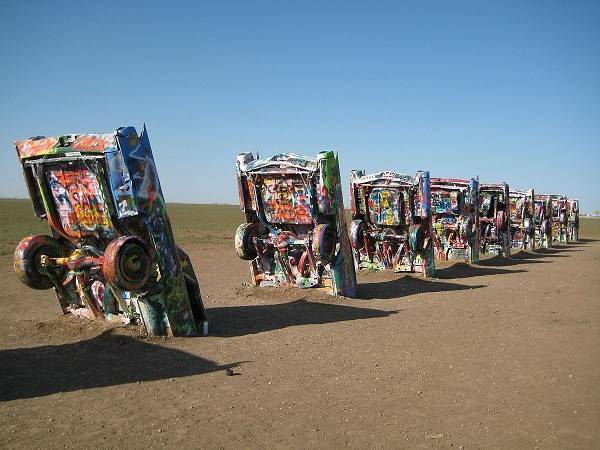 The visitors paint the cars with spray paint just like they do at the Cadillac Ranch. For those keen on geocaching, it is a geocache. Texas FM 2161 (Historic Route 66) from TX207 to Exit 89 of I-40, Conway TX. 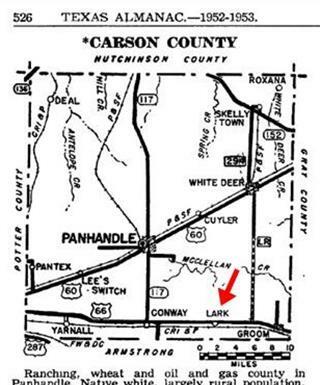 The seven mile portion of Texas Farm to Market Road 2161 between Conway (TX 207) in the east and I-40's exit 89 was listed in the National Register of Historic Places in 2007. This segment of US Highway 66 was chosen for protection because it is the best preserved and also one of the longest sections of untouched US Highway 66 in the State of Texas. This is a Map with Directions. Driving along this two lane road is like traveling back in time: it is the open range of the Texas Panhandle. Windmills pumping fresh water for the cattle, farmland dotted with the occasional windmill, grasslands and a few dirt county roads intersecting Route 66. This is exactly the scenery that greeted travelers of the 1930s, 40s, 50s and 60s: dirt roads, farms and fences enclosing the prairie. For those interested in driving the Old Route 66, above we describe the historic Route 66 alignment. On the north frontage road of I-40, west of Exit 87 (FM 2372), 10 mi from Conway just after the rest area. 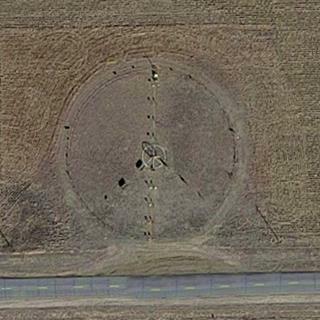 The Peace Farm is shaped like the CND sign 200 ft. in diameter (60 m). The CND symbol was an anti-nuclear logo created during the 1950s British campaign for nuclear disarmament. It combines the flag-signals (used in the navy) for letters N and D (initials of Nuclear Disarmament). It became very popular during the 1960s and 70s. The monument consists on many metal objects, signs and markers with peace proclaiming texts cut into them. It is the work of a local farmer, Richard D. Baker. To the east of Conway just before Groom, is another small town: Lark. A post office opened in 1909, but moved to Conway six years later. Population reached 10 in 1915 which grew to 20 in 1940. It had a school, church and a store. The post office reopened in 1925 but was closed for good in 1957. People moved out, the railway ceased operations in 1980 and in 1984 its population was 26. Lark was not included in the 2010 Census. Today an abandoned grain elevator marks the spot. And, to the east of Groom, is the infamous «Jericho Gap», a sector of the 1930s highway that was unpaved and became a quagmire when wet. From Conway at the crossing of TX 207, CR N and FM 2161 (0 mi. ), go westwards along FM 2161, which is no other than the historic U.S. Highway 66. This segment of US 66 was listed in the National Register of Historic Places in 2007. The road curves slightly after crossing CR I (5 mi.) at the point where FM 2 branches of on the left. Keep on U.S. 66 until meeting I-40 (7 mi.) by Exit 89. The Historic segment ends here. Stay on FM 2161 and turn right to take the overpass across I-40 and then leave FM 2161 taking a left onto the North frontage Road of I-40. Pass the next Exit 87 (FM 2372) (9.7 mi.) and keep west along the north frontage road. There is a rest area just after the exit (see the Peace Farm on the right). After passing CR D, 305, 307 and 309, you will reach I-40 Exit 85 (12.2 mi.). Marked by the Blue line in the map above. Cross BL 40 towards the south, and keep on FM 2575 (which runs on the north side of I-40), cross CR A (14 mi. ), which after CR (16.2 mi.) it becomes NE 8th Ave. follow it until it ends (18 mi.) with a sharp right curve becoming B Ave. The original alignment of US hwy 66 kept straight west but the airport was built and the road no longer exists. You have to detour around the airport. Going around the Airport: take the following course to meet US 66 on the western side of the airport: Go along B Avenue northwards until it meets BL-40 ⁄ US 60 - E. Amarillo Blvd. (19.2 mi.) and take a right, westwards onto it. At Folsom Rd. (21.7 mi.) take a left along Folsom and go south until Triangle Drive (22.1 mi. ), Triangle is U.S. 66. To the east is the airport and the now vanished US 66, covered by the runway. Take a right and go west along Triangle Dr. until TX 335. Triangle continues west after N. Lakeside Drive ⁄ TX 335 (23.1 mi.) but to cross the highway you must first go north to E. Amarillo Blvd by taking a right, then take a left to cross the overpass, and another left to go along the west side of TX 335 back to Triangle Dr.
At Triangle, take a right and keep westbound until meeting Amarillo Blvd. again (23.9 mi.). Here is an old Route 66 motel: Just along the Boulevard, next to the intersection, on the right is Historic Triangle Motel (see image below). At the crossing, take a right entering BL-40 and head northwest till you reach US 60 -E. Amarillo Blvd. (16.4 miles). Turn left with BL-40 towards Amarillo. Cross (22.2 miles) TX-335 and slow down to see Triangle Motel on the left side of the road just before it intersects Triangle Dr. (22.6 miles). Keep on straight along Amarillo Blvd till you reach Pierce St. (US 87) in the center of the city (27.3 miles) of Amarillo. 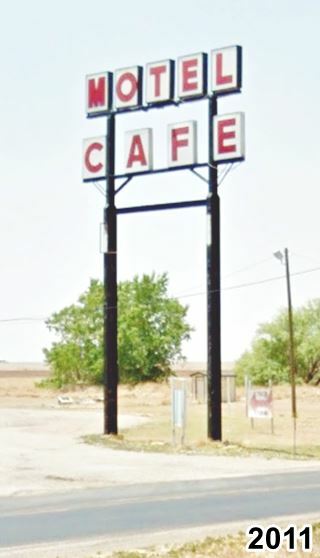 H. Allen Anderson, "Conway, TX" Uploaded on June 12, 2010 and "Lark, TX". Uploaded on June 15, 2010. Handbook of Texas Online, Published by the Texas State Historical Association. Panhandle snowfall National Weather Service.